Jason Day lays on the ground after collapsing Friday next to the ninth green. Jason Day’s wife, Ellie, tweeted this morning that her husband is going to play Saturday at Chambers Bay after suffering from benign positional vertigo during Friday’s round. Day collapsed Friday next to the green on the par-3 ninth hole (his 18th) after suffering from a dizzy spell. He was immediately attended to by medical personnel while his playing partner, co-leader Jordan Spieth, shooed away media members and photographers while Day was on the ground. He received further medical attention after the round, and is apparently feeling well enough to play the weekend at Chambers Bay. I'm inundated w messages & tweets you guys. Thanks for your support. We're gonna give it a go this weekend. Praying for a good healthy one! After the indicent Friday, Day mustered enough strength to blast his second shot from the back bunker and two-putt for bogey, completing a second-round 70 for two-under tournament total. 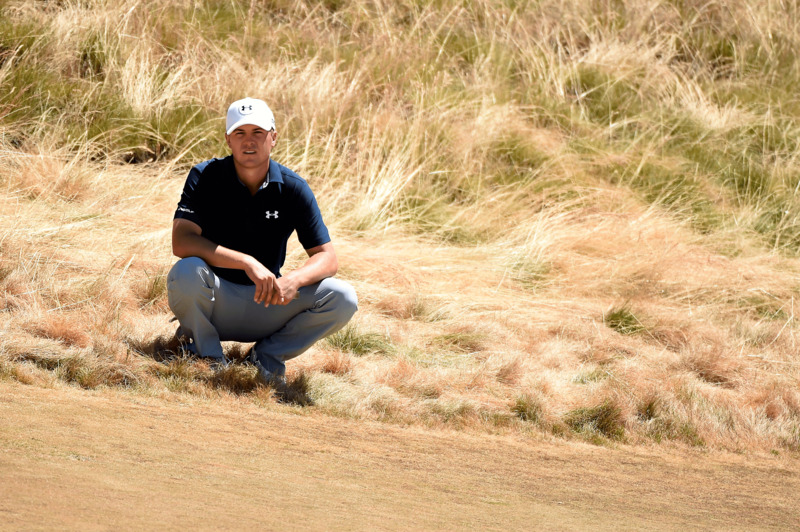 He's tied for ninth and three shots back of Spieth and Patrick Reed. Day has recently experienced difficulty with dizzy spells and sleep deprivation, as he detailed in a Monday press conference from Chambers Bay. He tees off at 1:55 p.m. PST today with Kevin Kisner.